We’re twelve days into 2014 and, as one might expect, there’s been a lot of reflection about 2013. The top news stories. The top political cartoons. The top films (and just FYI, if you haven’t seen 12 Years A Slave, American Hustle, or Mandela: Long Walk to Freedom, then you should stop reading this right now, go to Fandango.com, and purchase your tickets. I’ll be here when you get back). Anyway, you get the idea. I thought about doing that this year – I’ve done it in the past – but decided to do something a little different this time. 2013 got off to a rough start for me, personally and professionally. I was really struggling. One of my Facebook friends had posted a story/article/blog piece about counting your blessings. Every day, you write on a piece of paper one blessing in your life and then you put that piece of paper somewhere – a jar, a vase, a box – somewhere where you can see it. It seemed like a good way for me to focus on the positives in my life, so I decided to give it a try. Now, I have to confess: I did not count my blessings for the entire year, but I did do a pretty good job. I wrote my daily blessings on bits of colored paper and dropped them in the big glass vase that sat on my kitchen counter. 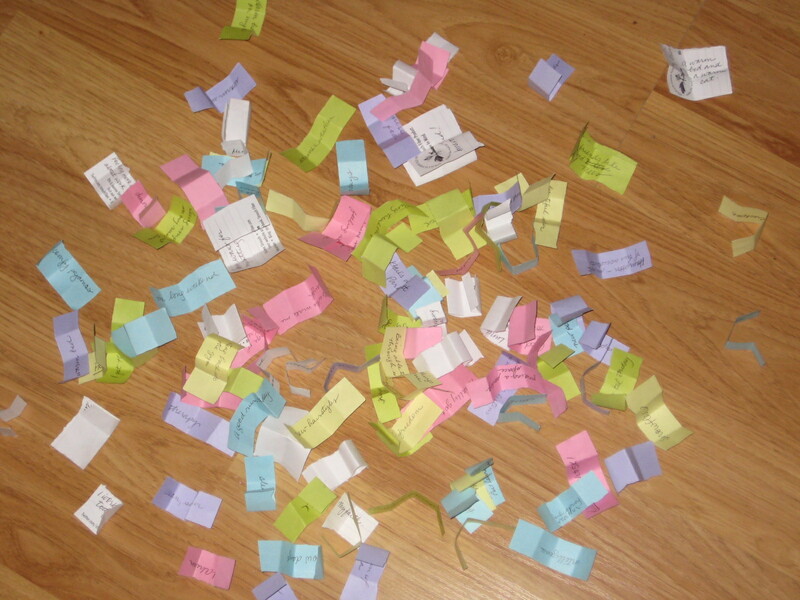 Yesterday, I finally got around to opening those bits of paper so that I could review my 2013 and the many things I have to be thankful for. The honeybells arrived! Last year, I got a six-month subscription to a “fruit of the month” club. First up: the honeybell. Honeybells, in case you are wondering, are the most amazing fruit ever. An orange/grapefruit hybrid. Sweet. Super juicy. So juicy that a bib is included with the shipment. If you’ve ever had one, you’ll understand why their arrival was such a wonderful blessing. If you haven’t, stop reading right now and go out and get some. They’re only available January through March! Cheerwine – another special treat. This is North Carolina’s version of Dr. Pepper, but not quite the same. I don’t think it’s sold anywhere else – at least I’ve never been able to find it. So whenever I visit my parents in NC, I try to swing by the Food Lion to pick up a 12-pack or two. Soooo good. Pushing my boundaries and getting outside my comfort zone. Now, I have no idea what I did here. I might have been referring to the Meetup group I joined, or maybe I went to a play by myself, or maybe I went skydiving. (FYI – pretty sure I’d remember skydiving). Whatever it was, it was something that I wasn’t used to and I did it anyway. Go me! Arlington County firemen. At some point in 2013, I got stuck in an elevator and I am totally not joking. I was in the elevator of my parking garage to pick up my car and head home after work. All of a sudden — BOOM! Elevator stopped. No power. I was alone. No a/c. And most importantly, I. Didn’t. Have. Anything. To. Read. People who know me will understand how important that is. Anyway, I managed to stave off panic by figuring that I probably wouldn’t die if the elevator fell – after all, I was stuck between basement levels 1 and 2, and the last basement level was 4, so it wouldn’t have been a huge drop. Broken bones maybe, but I’d live. Fortunately, I didn’t have to test my theory because the firemen from Arlington County saved me. I was extremely thankful. This one’s a two-fer: sleepover/afternoon tea with my sister and having the best sister in the world. My sister is married with a toddler, so for her birthday last year, I thought it would be fun to have a girls’ night. I booked us into the Willard Intercontinental, took her out for cocktails and dinner, and then the next day we shopped and returned to the Willard for afternoon tea. It was fun, relaxing, and nice to have time for just the two of us. We had so much fun we’re doing it again this year! As for “the best sister in the world” – well, she’s been my number one cheerleader for a long time. She tells me the truth when I need truth-telling, reassures me when I need reassurance, and makes me giggle when I need a good laugh. She really is the best. Spending the day with my niece. This is the best, especially now that she’s such a chatterbox. She is a little person with her own tastes and opinions, and I enjoy hearing about them – even when she tells me she doesn’t like something I knitted for her. Can’t win ’em all, I guess. So that was just a little glimpse of my 2013. I’m not doing this exercise for 2014 – not because I didn’t think it was worthwhile. It definitely was for me. I have a lot of wonderful blessings in my life and I hope that I will do a better job of remembering them because of this. No, this year I’m focused on de-cluttering. I’ll be headed overseas for my next assignment this summer, so I’ve got to clear out some of the junk. Collecting bits of paper – even ones with my blessings written on them – is counter-productive at this stage. That said, I’ll do my best to count my blessings every day.